This photo was discovered and sent in by Anne Zholyn (Thanks, Anne!) in July 2004. It's a snapshot of the 'Liberated Zone' (a.k.a. 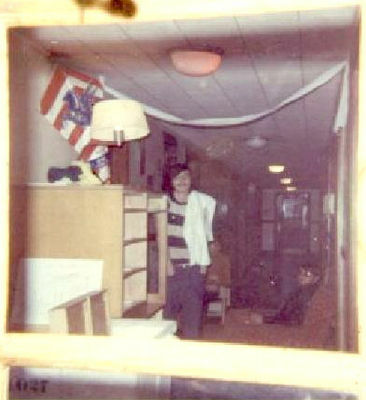 'Outlaw Territory') area set up in the central corridor of Snyder's 'Stalag 17' precinct (3rd floor center) during the 1969 - 1970 school year.